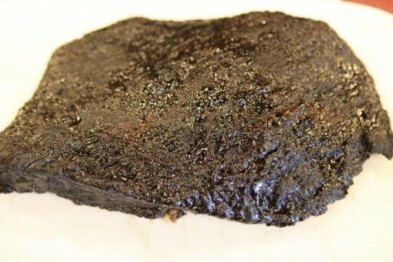 In my 8 years living in Texas, I learned that Oil, Football, and Brisket have become one with the culture. Sure, BBQ is everywhere, but it is your ability to prepare Brisket that distinguishes the mediocre from the exceptional. For good reason, Brisket is the most difficult of the traditional BBQ meats to cook. I’ve dabbled with Briskets over the years, but that Unicorn has always seemed to allude me, until today. Given that my smoked pork always comes out consistently good and is generally popular, I haven’t felt that compelled to attempt Brisket. However, a friend’s dad was in town from Houston, and I struck up a conversation with him. He and his entire family are Brisket enthusiasts with many years under their belts. As the conversation rolled on, his infectious energy encouraged me to try my hand at Brisket once again. He gave me many helpful tips, but stopped short when it came to his secret rub, his secret way to pick the best Brisket, and his secret way to judge when the meat is done. This is the sign of classic BBQ enthusiasts… they hold certain recipes and techniques as secret as the original Coke formula and are only passed down to family members by word of mouth. Never written. I love it. 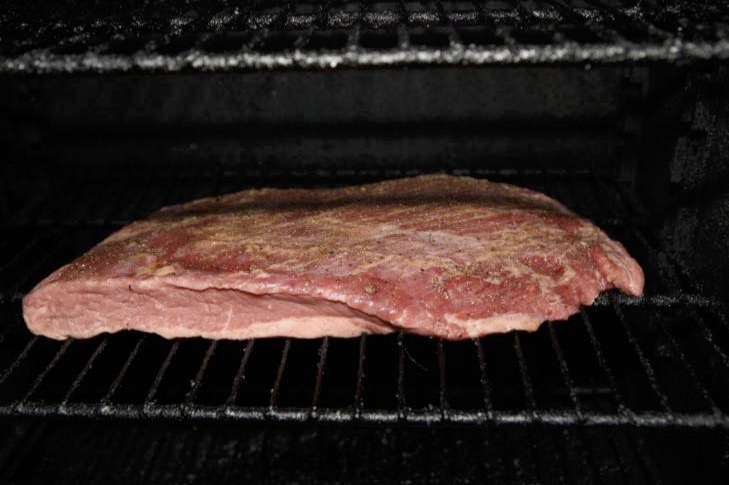 The main tip that I took away and was purposely going to integrate into this session was to cook the Brisket between 210-225F, which is easy to do in the Breeze. I just had to be willing to wait longer to be done. Before I provide the details of the entire cooking process, let me say that it worked. This Brisket was hands down the best I have ever made. Read on and I will describe details and maybe there will be a tip or two worth remembering. Before I started, first I’ll ask this question: How many different ways are there to make Brisket? Answer: As many ways as there are people making Brisket. Everyone has their own approach, and if you talk to them, you will often here emphatically that “their way” is best. 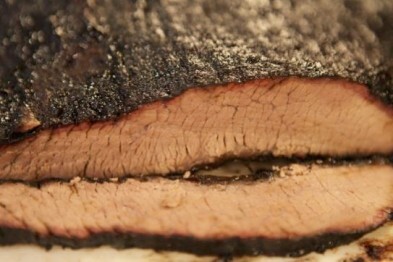 I’ve tasted a lot of good Brisket in the past, all cooked with definitively different “the right way”. Wood choice. Meat grade. Trimming. Spices. Mops. Injections. Charcoal Types. Cook Temperatures. Cook Times. Full Brisket or flat. Aluminum (gasp) or bare. Fat up, Fat down. Smoker type. Resting period. Sauce or Dry. The list goes on and on as to the areas to which every BBQ enthusiast will vary. For the purposes of this article, I will at least be straight forward with what “I did” in each of these areas with some perspective on my choices, but not provide any grade on correctness (although it did turn out pretty good). If there were a single “best” way to cook Brisket, why bother, right? As with my prior articles, the meat sets the stage for everything else. I visited Jungle Jim’s, which is a fantastic fresh food market in Cincinnati known for its eclectic variety of fresh and globally sourced foods. 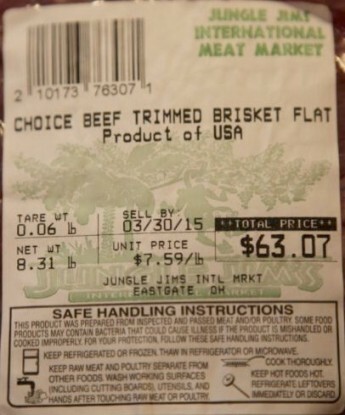 They carry Choice Angus beef, so I bought an 8.3 lb Choice Angus Brisket (CAB) trimmed to the Flat. CAB is the highest quality of the Choice grades so I assume it will be the most consistent piece of meat. 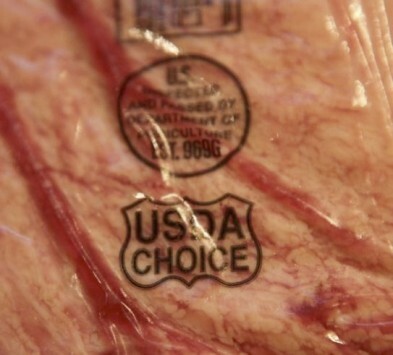 Given that the Brisket is basically a tough piece of meat that requires many hours to make edible, I don’t worry too much about getting Prime or Wagyu grades, as they are quite a bit more expensive. What I’m looking for is consistent quality. All cooking processes, if you want them to be repeatable, need to start with consistency. If the meat varies dramatically from one cooking session to the next, I can never be sure on the true impact of changing my other choices, like cooking temperature, time, and spices. that fat really affects the cooking time, so again for consistency, I went for the Flat. While I’m thinking about how to set up for success in smoking pulled pork, let me talk a little about the heat and smoke source. First, a Don’t. I don’t use Charcoal Briquettes. Will they work in the Breeze? Yes, absolutely. They actually burn very uniformly and are very dense so you can put a much larger load of them in the self-feeding fuel chute. The reason I don’t use them is two-fold. First, the way a briquette is made is by taking a combination of charcoal products and compressing and gluing them together with a binder. If there isn’t a binder, the briquettes would tend to fall apart. Manufacturers of the briquettes may use natural binders, but nevertheless there is an additive which could provide a slight flavor difference, particularly when you are subjecting the meat to 10 to 14 hours of cooking time. Second, Charcoal Briquettes produce more ash. I’m not sure why, but I know I have to empty the ash pan more often with Briquettes than with Lump Charcoal or Wood. So what do I use? First, the 8” diameter chute on the Breeze will handle just about any commercially available charcoal or wood source out there, so what you put down the chute is personal preference. Normally I would use Hickory on beef, but I found some Cherry and Apple woods at Home Depot so I decided to experiment with those. 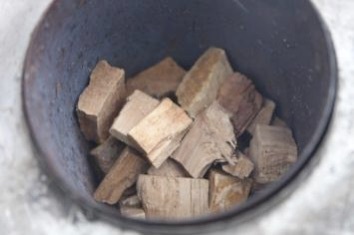 I use 100% wood for Briskets, no charcoal. I started with Cherry wood for the first half of the cook, and then ended with Apple. No rhyme or reason. Next time will try Post Oak, as that is the perennial favorite of Texans. It is just harder to source in Cincinnati. If eyebrows haven’t been raised to this point, get ready as meat prep is where much debate will occur. Recall I already bought a Flat, so there is no special attention to trimming the Point. For my trim, I kept is really simple. 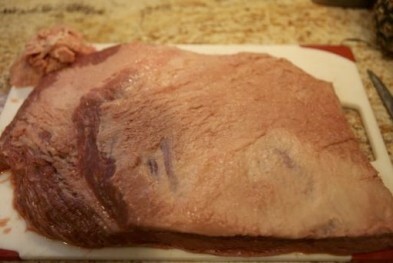 I trimmed all the fat off of the bottom side of the Brisket, and left about ¼ of an inch on the top. My basis for trimming the entire bottom off is so that the spices I add to that side will actually stay with the meat. 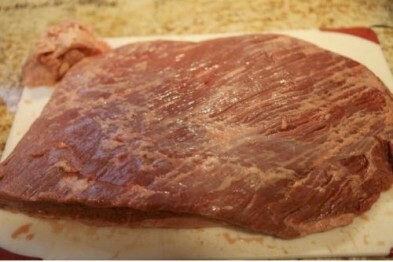 After pulling the Brisket, I often will cut of some of the fat on top, but don’t want to scrape away the spices. To spice the meat, I keep it pretty simple – 50/50 Salt/Pepper, a dash of ground cloves, garlic, and onion powder. Then I take a handful of brown sugar and coat the surface. Once I get a consistent flavor, I will become more exacting. For the time being, I keep it loose. 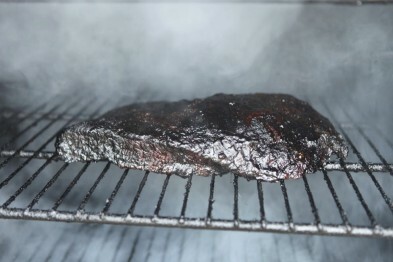 Finally, I leave the Brisket out of the refrigerator for at least 1 hour to let it come up to room temperature. What happens to cold beer, or iced tea, when it is first brought out of the refrigerator and taken outside? Unless you are in Arizona, it gets a lot of moisture built up on the outside surface of the container due to condensation of air born moisture. Does warm water or warm beer do this? Nope. My logic for letting the meat get warmer is that it lessens any potential condensation of smoke on the surface, to minimize any acrid flavors. During this same time, the salt will start to extract some of the water from the meat, which in turn will cause the brown sugar to dissolve and form a uniform glaze. I don’t know if this matters or not, it just happens. 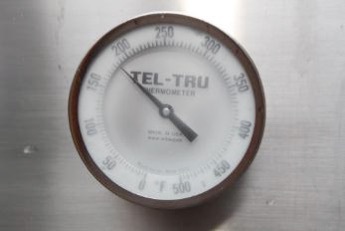 For this session, I want to target an average cooking temperature of 210-225F. 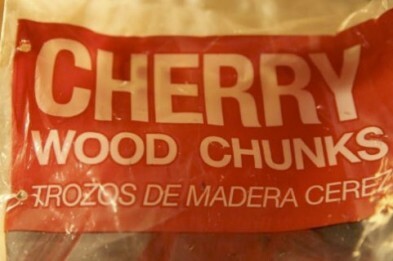 I light the Breeze, let it get to around 190F, fill up the chute with Cherry Chunks, and place the meat in the smoker. I put the meat in fat side down. There are only two reasons I’ve heard that influence whether the fat should be up or down. The first reason for “fat side up” is that the fat will then baste the meat as it renders. For beef, the fat does not render much. Pork loses fat like squeezing a sponge, but beef fat stays there, just mocking me in its resilience. The second reason for positioning the fat is based on temperature variation in the smoker. Fat is an insulator, so you would normally place the fat on the side where you expect to get higher temperature spikes. If the top side of the meat has higher air temperatures, like in most side box burners, then fat should go up. If you place the Brisket close to the fire, then it should be fat down to insulate the meat from radiative heat from the fire. For the Breeze, the temperature is the same everywhere and the fire is so far away that there are no radiative heating issues either. As such, it’s dealers choice. I place the fat side down so that it separates the meat from the grate. Just to be clean on the wood – I filled the chute with Cherry at 6:45. At 11:45, I refilled with Cherry, then went to bed. I woke up at 5AM and filled the chute with Apple chunks, then I pulled the Brisket at 9AM. Total cook time was around 14 hours. 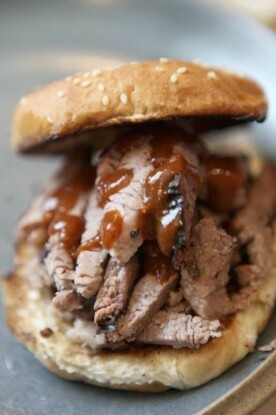 My biggest concern with Brisket is cooking just until the meat becomes tender, but not a minute longer. My scientific approach to measure tenderness is to jab a skewer into it and feel for resistance. The first time I opened the oven door was at 7AM, or after 12 hours of cooking. I jabbed the meat and it still felt stiff. When I reopened the door at 14 hours (the second and final door opening), the skewer slid easily into the meat, so I pulled it. Look at all that smoke!! Like any good meat, it needs to rest for a period of time. 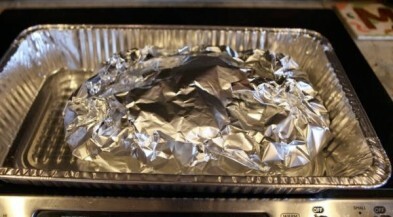 I wrapped it in several layers of aluminum foil and put it in my kitchen oven, oven off, for 2 hours before I cut into it. The pictures below show the meat wrapped and what it looked like right before I cut into it, right after, and ready to eat on a bun. The grain structure was about as good as could be expected. When I pulled a slice of meat apart, it had a slight resistance, and then you could see the intercellular fat layer pull away. At the beginning of the article, I mentioned that my motivation for the Brisket session was based on a recent conversation with a Texas friend’s dad, who lives and breathes Brisket. I invited her over to get an experienced outsiders opinion. She loved it! She said that the texture, smokiness, and smoke ring were perfect. As another famous Texan once said, “Mission Accomplished”… only it is true this time!